These Danish apple bars are wonderful treat for everyone. 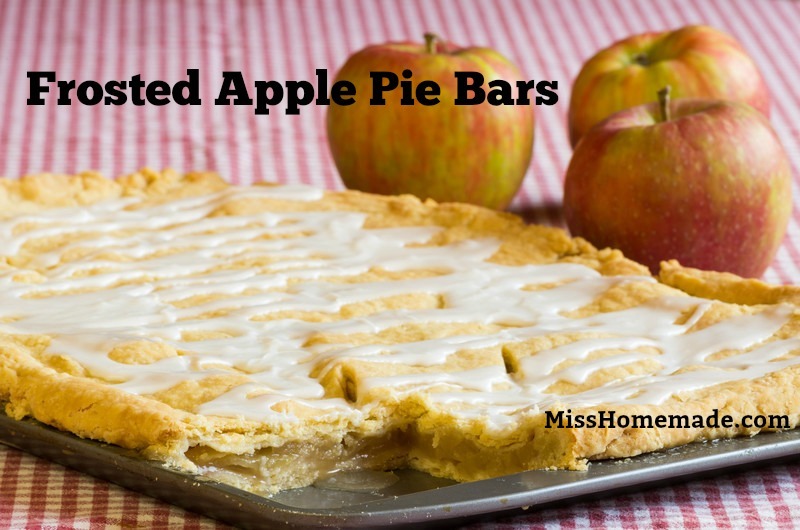 The frosted apple pie bars are a favorite of mine; see for yourself. In a large bowl, combine 3 cups flour, baking powder and salt. Cut in butter to the consistency of coarse crumbs. Stir in 1 cup cold milk slowly until completely blended. Separate dough into two balls. Roll out one ball of dough to fit a 15 x 10 inch pan with some dough extending over the edge of the pan. In a large bowl, combine sliced apples, sugar, cinnamon and 2 tablespoons flour. Place filling in an even layer over prepared crust. Thinly slice 1/2 cup butter and evenly distribute over the apples. Roll out the remaining dough and place over the apple filling. Seal edges and prick the top all over with a fork. Bake for 30 minutes. Cool 5 minutes before frosting. In a small bowl, combine powdered sugar, 3 tablespoons milk, 1/3 cup butter and vanilla extract. Beat until smooth and creamy. Want to impress your friends and family even more? Serve with homemade vanilla ice cream. Combine flour, sugar, lard and salt for pie crust. Add enough milk to egg yolk to make 2/3 cup liquid. Add egg mixture to flour mixture, toss lightly until dough holds together. Roll out half of the dough to fit a large cookie sheet or jelly roll pan. Sprinkle corn flakes over dough. Spread on a thin layer of apples. Cover with sugar and cinnamon; roll out remaining crust and fit on top. Make steam vents and bake 1 hour.